Chadwell Heath was first mentioned as long ago as 1254 when it was known as Claudeswell, but this was later changed to Chadwell Street. In 1440 it was part of the Royal hunting ground for King Henry VIII. Chadwell Heath is built on an old Roman Road linking London to Colchester and, whilst we don’t know if Saint Chad ever visited the area, it was a well known route for pilgrims. 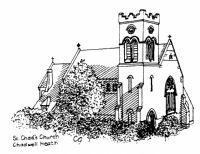 By the 1800’s Chadwell Heath had grown into a large village and, in 1877, a group of local clergy and gentry met to discuss the possibilities of building a church to serve the growing community. Richard Payze, a local businessman, generously donated the land for the church building. Frederick Chancellor, a church architect, was given the task of drawing the plans for the church building (he actually produced five different plans) before the final choice was made. It took seven years to raise the £3,000 needed to begin the work. The foundation stone was laid on 28th May 1884, but it was nearly two years later, on 2nd March 1886 (Saint Chad’s Day), when the building was first able to be used for Sunday services. Saint Chad’s was opened as a daughter church to Dagenham Parish church and it would be another nine years before Saint Chad’s/Chadwell Heath was a parish in its own right. This took place on 25th June 1895 when the Bishop of Colchester dedicated the church building. The clock tower was built to celebrate the Diamond Jubilee of Queen Victoria (1837 - 1897) and was a gift of T.H. Sale of the Bengal Engineers. It was dedicated on 2nd August 1898 by the Bishop of Saint Albans. Saint Chad’s has, for one hundred and twenty years, faithfully served God and the community of Chadwell Heath and we are thankful for the vision and commitment of its founding members, and those who have served and worshipped here over the years. Today, you will find Saint Chad’s to be a very relaxed, informal and lively family church with a whole range of activities to cater for people of all ages. At the heart of our life together is the belief that Christians are called to serve Jesus and one another and this is summed up in our church motto: A Christian Community Seeking To Serve Jesus.